It started with a doctor encouraging local farmers and patients to raise capital to build a dairy. Over 100 years on and the historic dairy is still working with the families whose ancestry became the original suppliers to Colston Bassett dairy. Danusia Osiowy visits Nottinghamshire to find out more about one very successful co-operative. It is the centrepiece of many a British Christmas cheeseboard and the savoury treat at the end of a meal. And like it or loathe it, there’s no denying its reign as one of the most famous blue cheese in the world. There are just six dairies in the world licensed to make Blue Stilton cheese and, by law, it can only be made in the three counties of Derbyshire, Leicestershire, Nottinghamshire. So what better time to visit Colston Bassett dairy, which has been producing their world-renowned blue Stilton for 103 years and helping farmers add value to their milk. On arrival in the small village of the same name, the flagship dairy is located by the main roadside capturing the attention of all passing traffic. With 1913 carved into the stone building it’s a timely reminder how the business was operating before both World Wars began and is testament to the vision of a local doctor, Dr William Windley, who formed the co-operative with local farmers. His premise was simple - to produce consistent and well-made cheese in a purpose-built dairy in response to a growing demand by potential customers of the time. In 1920 the dairy started to make Stilton and, except for once again stopping during World War II to go back to the Cheddar-style cheese, by the 1950s Stilton was produced throughout the year. Colston Bassett remains one of the smallest Stilton dairies in the UK and today the Nottinghamshire-based dairy sources milk from four different farms each located within 1.5 miles of the dairy. “We still have the original farms supplying us and we have reduced the number we use due to the consolidation and growth in size of these farms. You only have to look at the farmers who supply us to understand they are the best they can be and progressive in their thinking,” says Billy. The dairy has gone from producing 30-40 seasonal cheeses in 1913 to 160 cheeses a day, 420,000 tonnes a year across 341 days of the year. During that time, there have been just five dairy managers at Colston Bassett and overseeing the production for the last 17 years is cheesemaker Billy. The co-operative has been on quite a journey since the outset not least from switching to pasteurisation following an accusation of bacterial contamination by an MP at Christmas in 1998. Although the claim was never proven, it influenced the dairy – who was the only one at the time to still be producing a raw milk Stilton - to invest heavily in pasteurisation. The introduction of a Protected Designation of Origin certification means all Stilton is now made to a specific recipe using only pasteurised milk. Colston Bassett Stilton is made in a more traditional way than most other Stiltons as the curd is still hand-ladled before draining, which preserves its structure, resulting in a creamy texture when the cheeses are mature. The rind of each wheel is also sealed by hand. The dairy, which also produces Shropshire Blue, closes in March and undergoes a major maintenance including repainting and repair work. It’s clear the dairy has a very transparent relationship with its four farmers and the criteria to become a supplier is three-fold. The farmers supplying the milk to the dairy are signed up as shareholders and while there are currently about 50 members, only four supply the dairy with milk. The milk is balance managed through First Milk to enable the dairy to buy what it needs based over a 12-month period. Producing Stilton is a very intricate process and Billy’s knowledge and astute business acumen is apparent throughout the whole conversation. As only the fourth dairy manager in 100 years he is understandably guarded when asked about the formula of his ingredients and what it is that helped them win supreme champion at the International Cheese Awards in Nantwich two years ago. As the business has evolved under each manager new innovation and technology has been introduced and three years ago Billy began implementing his 10-year plan and built four maturation units to increase their production capacity. Stilton is open to the elements for eight–12 weeks and it’s unpredictably when placed against varying oxygen levels and climate remains a challenge. It takes about 72 litres of fresh milk to produce one 7.5kg Stilton Cheese and operating one mile from the dairy is brother and sister team Jill and Michael Faulks. If the dairy boasts a rich history and traditional production, this 224-acre farm embraces the polar opposite, investing heavily in dairy technology. 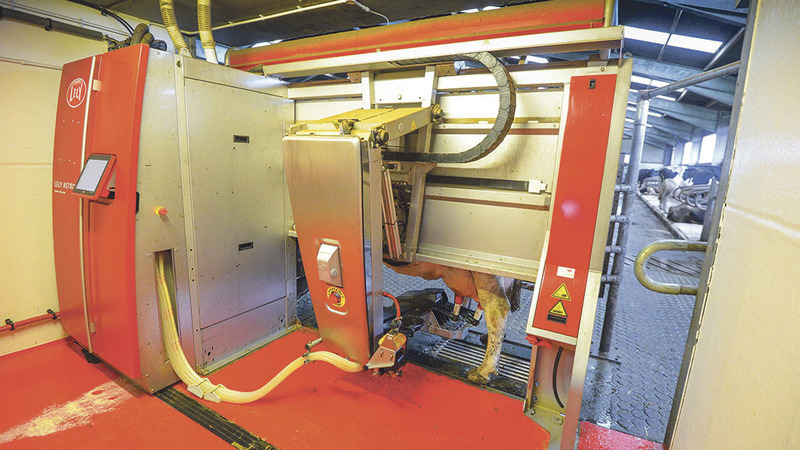 While robotic milkers are far more utilised on farms these days, being greeted by one pushing the feed up to the cows to eat is a sight to behold – particularly when said robot travels back unaided and plugs itself in for a recharge before starting the whole process again. Orignially it was their grandfather who took on the farm tenancy in 1920 and the family were then given the chance to buy the land in 2008 to further secure their future. Jill and Michael are joined by his son, Sam, 32, who also co-runs a contracting business with his father. “Sam is really one of the main reasons we decided to go for robots,” says Jill, who returned to the farm when she was 22 after spending time working in Nottingham as a secretary. 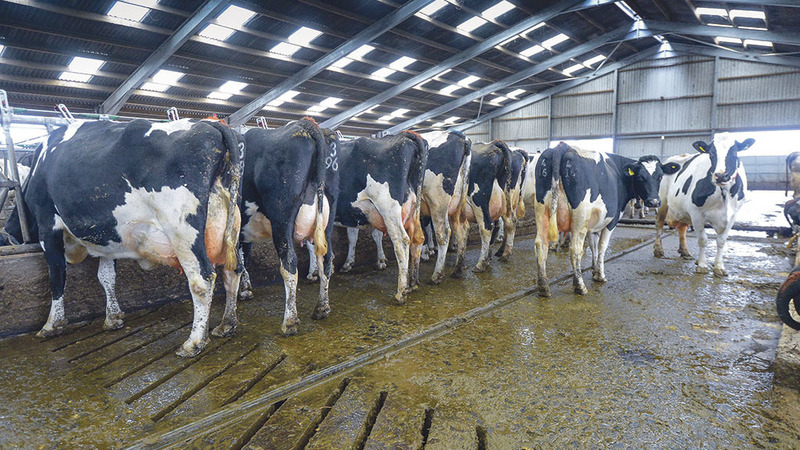 After recalling experiences of hand milking into buckets, 20:20 parlours and working in old fashioned pits, Jill travelled to Holland to look at farms using robotic milkers and the family haven’t looked back. On January 25 this year, two robots arrived and were established in the newly-extended shed to accommodate the 110 Holstein Friesan cows. At £200,000 a piece, their investment has been heavy but the consequential results have improved efficiency, created a better work/life balance and provided a new avenue for Sam to become involved with. “I don’t think it was as much of a shock to them as it was to us,” says Michael. “We knew the initial weeks were going to be tough as each cow needed to be lasered in and the readjustment to their management. Predominantly summer calving, most of their cows are home-bred and Michael hopes to increase numbers to 120 next year. Averaging 9,500 litres per cow, the milk has always been supplied to Colston Bassett and is now part of the farm’s heritage. Alongside their current milk price of 20.3ppl the family receives an annual bonus from the dairy for producing the milk. “We have the knowledge our milk is being used in a quality product and we are priviledged this is the way it has always been,” says Jill. “We receive a good bonus and we are in a postion to then invest in the future so that eventually we can take a step back. Needless to say the family always has Stilton as one of its staples and it definitely is not just a cheese consumed at Christmas. Recently, to encourage consumers to take a fresh look at Stilton and Shropshire Blue the dairy has worked with six top chefs who excel in a particular cuisine. The result is a recipe book featuring new dishes including stilton and mixed mushroom wontons, crispy braised ox cheek and Zurek, a Polish-inspired sourdough soup with Stilton. The little books have been sent out to all of Colston Basett’s customers, which include Booths, restaurants and specialist cheese shops. “We are trying to encourage consumers to try it within different cultures and make fantastic recipes with a traditional cheese,” says Jill.